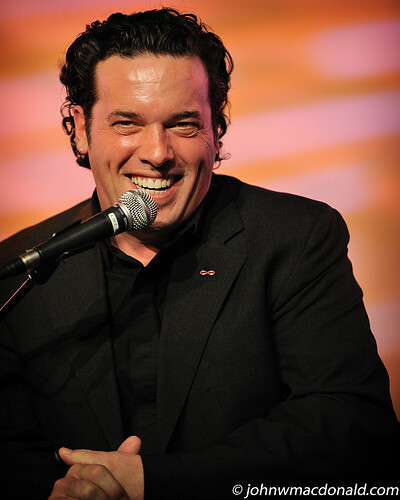 Joseph Boyden, originally uploaded by johnwmacdonald. Not since John McDonald's 2006 impromptu Axl Rose (Guns N' Roses) dance electrified an Ottawa audience until Joseph Boyden made his moose calls on stage. A man of many talents. One day I'll put the audio online and we'll see if any moose in the area are influenced to come out of hiding. Do you _have_ the audio? Because, tho' it pains me to have to say it, our recording got messed up and we don't have it. say you do. I have a couple of minutes or so of *.wav files of Boyden's moose calls. That's about it. You can have it to edit if you want to. Oooh, sure! We lost all the audio from that event. Actually, also... contact the CBC show Q. They asked us for audio of the moose calls, and they might still be interested... just a thought.